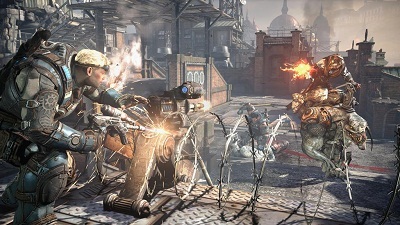 Cowen & Company analyst Doug Creutz has forecast disappointing first month North American sales for Gears of War: Judgment and God of War: Ascension, ahead of the NPD Group’s release of official market data this Thursday. The analyst said in a research note that sales of the two games – which are the fourth home console entries in both series – are expected to have fallen well short of their predecessors’ first month totals. In contrast, Tomb Raider and BioShock Infinite are believed to have made solid starts at US retail. Creutz wrote: “War, What Is It Good For? Not Much. We had expected sales trends to improve in March due to a strong core lineup. However, while some titles appear to have done well, including Square Enix’ ‘Tomb Raider’ (est. 696K console units in 33 days) and Take-Two’s ‘Bioshock Infinite’ (est. 665K console units in 10 days), two historically strong franchises appear to have significantly underperformed. Microsoft’s game currently has a Metascore of 79, while Sony’s is rated at 80. In the UK, Tomb Raider, BioShock Infinite and Gears of War: Judgment all topped the all formats all prices chart, while God of War: Ascension peaked at No.2 following its first week of availability. Yesterday, Wedbush Morgan’s Michael Pachter and fellow analyst firm EEDAR said they expect Xbox 360 and PS3 to lead US hardware sales in March, while Wii U looks set to record another disappointing month, only managing to outsell Vita, PSP and PS2.